MISSION, KS--(Marketwired - Mar 24, 2014) - (Family Features) As winter gives way to spring, it's the perfect excuse to gather together with your loved ones. This time of year is ideal for casual brunches, so for your next midday feast with friends and family, take your inspiration from the changing weather and create a brunch menu that mimics the flavors of the season. Whether you're planning a brunch for a group of five or 15, a little pre-planning will help ensure the event is big on fun and low on stress. Take a cue from Mother Nature to establish the theme for your party. Simple bouquets of early-season blooms provide a colorful and welcoming backdrop for a casual brunch hosted indoors or out. Use vases in a variety of shapes, sizes and colors to create a sweetly whimsical look. A buffet-style brunch makes it simple to serve your meal and it allows guests to mingle and snack as they wish, leaving you free to visit and enjoy a leisurely party, as well. Big taste comes in small packages. Serve your guests a plethora of smaller, bite-size appetizers which allows them to sample different flavors. Keep with your spring theme by incorporating fresh, seasonal ingredients. To discover more delicious Apple Butter recipes, check out www.musselmans.com/recipes or visit www.musselmans.com/recipebook to download the free e-recipe book. Preheat oven to 400°F. 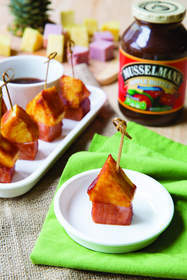 Pour Musselman's Apple Butter, barbecue sauce and mustard into bowl and stir to combine. Cut ham and pineapple into 3/4-inch cubes, about 36 each. Place one pineapple chunk on each toothpick, followed by a chunk of ham. Stand the picks up on baking sheet and brush each one with BBQ sauce mixture. Cover all sides. Bake for 10 minutes. Serve warm with remaining sauce for dipping. In bowl, stir together baking mix, milk, 1/2 cup sugar, egg and 2 tablespoons of melted butter. Pour two-thirds of batter into 8-by-8-by-2-inch glass baking dish coated with nonstick cooking spray. Cover with apple butter. Drop remaining batter by spoonful on top. Combine coconut, pecans, 1/3 cup sugar and 2 tablespoons butter. Sprinkle on top of cake. Bake at 350°F for approximately one hour, until cake tester inserted in center of cake comes out clean. Note: Pan will be very full so do not substitute a smaller pan. You may want to place a cookie sheet under the pan in the oven in case of drips.